Cartridge guns are suitable for the controlled application of pastes, gels, adhesives and fluids. This industrial applicator is designed to work with 12 Ounce size cartridges, Semkits and Techkits and features a built-in adjustable electric speed adjustment to set flow rate. The AD600 battery operated sealant gun comes in a sturdy purpose built carry case for safety and convenience and includes all the essential components you'll need for speedy and efficient sealant application to both horizontal and vertical joints using all 12 Ounce sized cartridges including Semkits and Techkits. Advanced features include an adjustable speed regulator, residue indicator and reverse action (to eliminate drips). Now it is has become easier to work in confined spaces with single handed adjustment to flow of material. The AD600 is a Li-ion battery powered, electric dispenser, without rear piston rod. The result is a very lightweight and compact tool. The AD600 has anti-drip feature and one-hand speed adjustment making it possible to alter the speed while working. 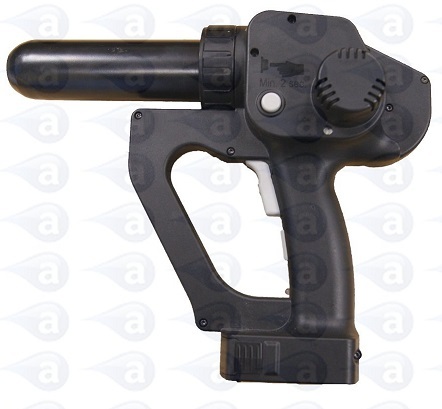 Electric rod drive eliminates air entrapment into materials associated with pneumatic guns. For any application requiring controlled non-drip dispensing of sealants, silicones, greases, pastes, gels and other materials, this new dispensing system is ideal. Battery charges in around 25 minutes and will dispense up to 75 to 100 cartridges from a single charge. Guns are robust and handle most liquids and pastes dispensed from them. The handle cap uses a hard wearing rubber gasket seal for the retainer that can be replaced after very long periods of use. Items are shipped in the UK by a courier on a next day tracked and insured service for all products that are available from stock. Items on a lead time will be shipped as soon as they are made available. Overseas shipments are via UPS or DHL. Typical Applications:- Deposits of sealants, solder paste, deposits of solder flux, grease to bearings, potting components with epoxy, RTV to edge seams, silicone shots to bond products, gasket sealant repair, aircraft maintenance work, general adhesive applications.